Good for you! Enjoy and look forward to seeing your return in August. 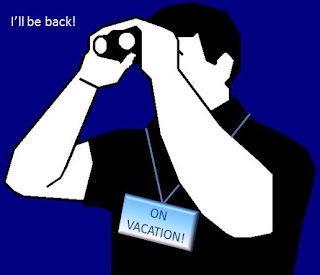 Enjoy the break- see you on the flip side. Have a good break! I'll miss your blog and tweets but a break is a really good idea. Hope you are having fun and hope you come back with some great bird photos! I'm sorry-blogger management just called and they need you back to work-pronto!Just kidding-enjoy your break.I don't take blogger breaks because I don't post frequently enough to begin with.